Look at this beastly stud, no wonder Albert is Mac Meda's President and Rackstraws hero! Everyone knows Albert, the San Diego Zoo’s famous silverback gorilla. Albert is famous for three things. 1) He was responsible for starting the gorilla population at the San Diego Zoo, which drew world-wide attention and became the star attraction with his ability to put Viagra to shame. 2) He got a restaurant named in his honor at the San Diego Zoo. 3) He was the president of Mac Meda Destruction Company. Besides the fact he was a total stud (screw the restaurant part), he was Bob Rakstraw’s hero. Bob was obsessed with Albert and spent every Monday afternoon at the gorilla house. Jack used to go with went him and all Bob did was stare at his hero and mimic his moves. You know like scratching his balls, gross things like that. No doubt this was entertaining to Jack, who probably enjoyed watching the Rackstraw show, drinking a beer and chuckling at the shocked, more likely, disgusting expressions the tourists had when Rackstraw and Albert would share a bonding, like, picking their butts together. Another reason why Jack went, he never knew what Rackstraw was up to, sort of like that game show, “What do we have in Door #1? or In Door #2? Surprises were always Rachstraw’s MOs. 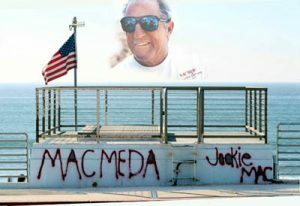 Albert MacMeda was listed in the La Jolla's and Borrego's Phone book for years, making everyone believe he was a real life person. One time they went to see Albert and Rakestraw carried a bag. Jack figured it was a fifth of something, which seemed logical. When they got inside, and were passing the rhinos, Rakestraw hopped over the wall, jumped across the moat, and pulled out of the bag a Mac Meda stencil and red spray paint. Then ran to one of the rhinos and sprayed painted a Mac Meda logo on the side of a rhino. I think Bob went to jail on that stunt. Every time Albert became a father, Bob passed out cigars. And that alone had to have cost Bob some bucks, God-knows how many of Albert’s descendents are running around today. Hummm … a bit of Deliverance at the zoo I would say. Getting back, it seemed logical that Albert became the president of Mac Meda. This obsession went to the jokingly extreme; they added Albert in the La Jolla’s and Borrego’s phone book, made business cards and t-shirts that were first designed by David Osborn. You can see David’s first original designed at the bottom of the left side column. 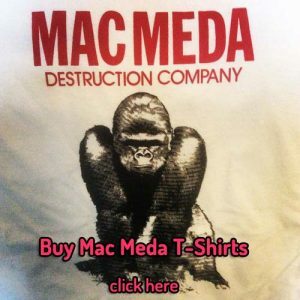 Just about that time, Doug Moranville and Steve Wyre were starting this new silkscreen business, and the Albert Mac Meda shirt was the Branding Iron’s first real customer. But probably the biggest con [or joke for that matter] was for almost a decade the cops were searching for Albert MacMeda, the infamous president of the outlaw gang that ran havoc in La Jolla, California. Little did they know, the real Albert was already caged or behind bars. When Albert died in 1979, and even if Jack never saw Bob after 1971, it was said that Rackstraw mourned and went into deep depression by going on a drinking bender that lasted over three months. 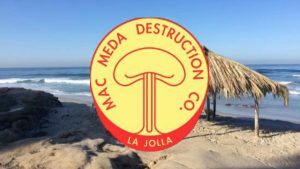 Mason “Kip” Tilden [Mac Meda Destruction Co.and Albert]/’Pump House Gang’ rode ‘his last wave’ in this life early this year, 2017. We will be doing a paddle out in his memory. Meet at the “shack” 10AM JUNE 10TH. A scouting party will be there at ~ 0800. See ya there. Albert was an massive incredible 400 pound specimen of a Silver Back Low Land Gorilla. In an old ZooNews Magazine (I use to have) the zoo wanted to try some experiment on Albert and had built a metal room with a steel door and about a 1” thick 16”x16” bulletproof glass observation window. They put Albert in the room and as they looked through the window at Albert he fired his fist into it the bulletproof glass and fractured it! They said it appear that he did not hurt his hand. As I recall that was it for jacking him around (worried about the steel door holding?). Macho tourist Jerks at zoo would like to taunt the caged animals. When they screwed with Albert he would calmly fiddle with his hands, but what he was he really doing was making a snowball out of poop. Then the jerk got a 100+mph Noel Ryan like poop-fast ball. That the kind of stuff that made him President of Mac Meda!. I think they had to install a Plexiglass shield at some time. I saw him in an outdoor setting once with about 5 or 6 other Gorillas at feeding time. They tossed in a bunch of palm leaves and Albert went for one gorilla to another taking the best stuff and leaving them with wilted crap while he had a great big pile of prime palm leafs. None of the others gorillas even dare to make a grunt.